I have noticed, in my years in music, a clean division into two camps of thought. On one side, there are the formally educated musicians, and, on the other, the self-taught. I work and have interracted with both; in fact, I am both: formlly trained in some areas; self-taught in others. These two camps of musicians usually have very strong opinions about one another and those opinions usually keep a distinct border between them. "...I brought the song 'Yesterday’ to a recording session and the guys in the band suggested that I sang it solo and accompany myself on guitar. After I had done this George Martin said to me, "Paul I have an idea of putting a string quartet on the record". I said, “Oh no George, we are a rock and roll band and I don’t think it’s a good idea”. With the gentle bedside manner of a great producer he said to me, "Let us try it and if it doesn’t work we won’t use it and we’ll go with your solo version". I agreed to this and went round to his house the next day to work on the arrangement... He took my chords that I showed him and spread the notes out across the piano, putting the cello in the low octave and the first violin in a high octave and gave me my first lesson in how strings were voiced for a quartet. When we recorded the string quartet at Abbey Road. it was so thrilling to know his idea was so correct that I went round telling people about it for weeks..."
I know so many musicians who think training is bad -- that is homogenizes musicians. I suppose it can. The variety of, say, singing voices in pop music can be a direct result of people not knowing "how to sing," though. Formally-trained snobs, often think "doing things properly" is everything, but, sometimes music from the heart, however "wrong" it may be, can be wonderful. Martin knew the benefit of staying open to great music, no matter the source. On this blog, I come back to balance a lot. 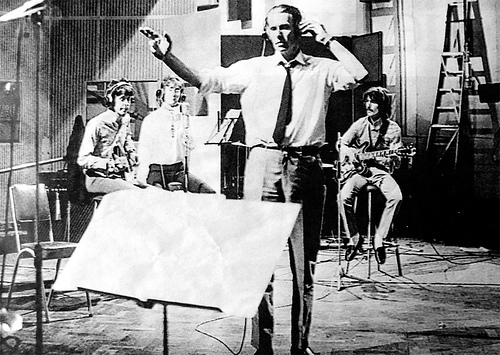 George Martin could not have done it on his own; the Beatles could not have done it without him. We follow our own paths in music, art and in life. Often, grand results come out of both accident and flexibility. The Beatles are a great example of that. Rest in peace, Sir George. Thanks for guiding the lads to greatness.